WHOOO! 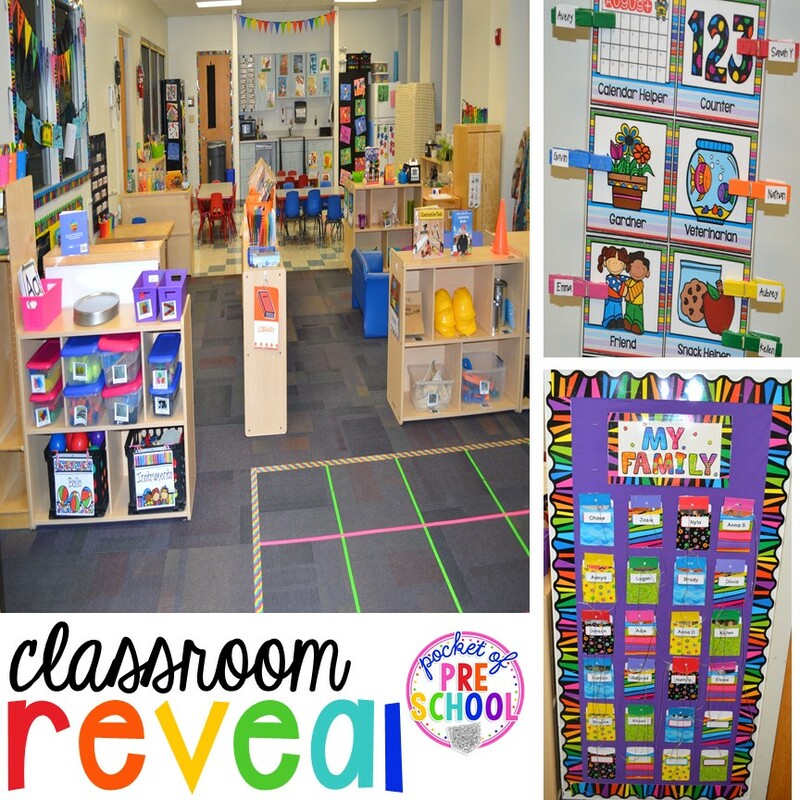 The BIG classroom reveal! I made some new additions to my rainbow classroom this year and kept all my fun makeover items from last year too! When I was taking the pictures for this post I thought of a few more things I want to update. It is always a work in progress! I am always adding new activities, taking out the old, putting up new student work, taking down the old, and organizing. ****This was my FULL DAY classroom! I taught multi age preschool in this amazing classroom for 11 years! I now teach half day preschool out of my home. We transformed/finished, our walk out basement into a preschool. I’m hoping I can find time to reveal my new classroom to you soon! This is a look from my circle area. I have a long room with a L shaped space on the left. Behind the windows are my office and the child development observation window. I have a lab classroom in a high school. Above the cubbies are two big bulletin boards. I added the square scrapbook paper to it so I can easily put up and take down students’ work. I’m going to add clothespins to each square to make the changing of boards even easier! These little people are from my All About Me pack. On top of the cubbies are the students’ portfolios in binders and the portfolio crate. 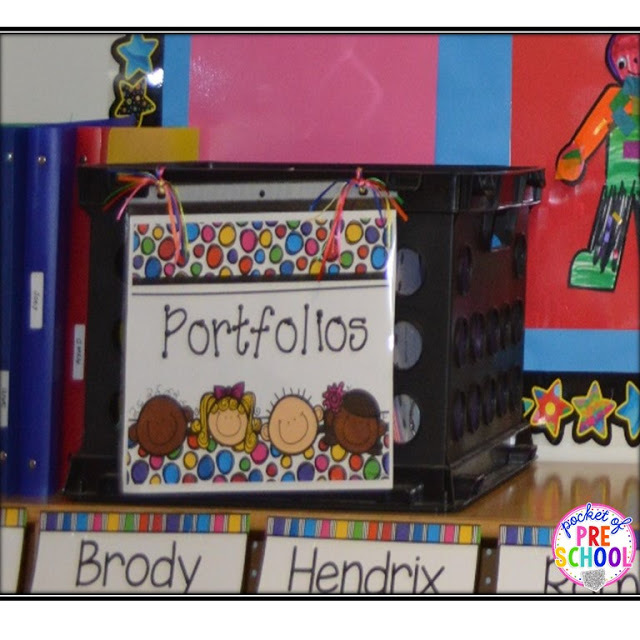 You can read all about how I do portfolios and assessments with my preschoolers HERE. Go check out Portfolios and Assessments made Easy in my TPT store HERE. I made new colored stars for each student this year to use for the Question of the Day. The stars are attached with Velcro and have a magnet on the back. When students come in each morning, they pull their star off and answer the question of the day. This makes remembering the morning routine super easy. They put their lunch in the fridge and answer the question all in the same place! And I finally have the editable rainbow name plates in my store. Just click HERE. GAME CHANGER! Seriously, Question of the Day is AMAZING! It gets students learning the minute they walk in the door. It’s the perfect way to start the day. You can read more about how I do question of the day HERE and check out my Question of the Day packs in my store HERE. Don’t you love how fun the super stars look! Oh and our mascot is a super star. Stars are everywhere in our classroom! My circle area received some fun updates and changes! I moved my gross motor shelf which was where the green bulletin board is because It was a distraction for some kids last year who sat next to it. I LOVE the grid for students to sit in. I made it using duck tape. Warning…it does leave a nasty mark when you take it off! Have you ever noticed that is is super hard for kids to make a real circle when you need them too for an activity or class meeting? I have a solution to the problem…make a rainbow tape square around the edge of the grid. You can simply say, “everyone stand on the rainbow” and they move there! It’s amazing! Linear Calendar…AMAZING! It will change the calendar time into a time where students are engaged and talking about math! I LOVE calendar time. Check out how and WHY I do a linear calendar HERE. I needed a place for lesson plans and teacher supplies so I placed crates under my easel! In it are our lesson plan boxes! It is right there in case I need it for reference. My teacher supplies are on top of the crate and in my bright yellow bucket! They are close to me so I can grab them when I need them but still hidden from my students. Our class rules have been updated with a new clip art and a new font! Find out how I teach our classroom rules HERE and check Class Rules out in my store HERE. GAME CHANGER! For behavior, I use a red and green choice board. It works wonders! Simple and visual for my young learners. It is hands down the best thing I have ever made and implemented in the classroom. Negative behaviors decreased which meant I had more time to teach and play with my students! It is the number one seller in my store and has been for a few years now. There are teachers from Preschool all the way to Second grade who use it and LOVE it! You can read all about it HERE and check out Green & Red Choices HERE in my store. One of my favorite summer projects was my new visual schedule! It looks like a long day because it is. My full day classroom is open from 7 am – 6 pm. I put the morning on the left and the afternoon on the right to help break up the day into manageable pieces for my students. It visually shows what we are doing right now, what is next, and what is over. 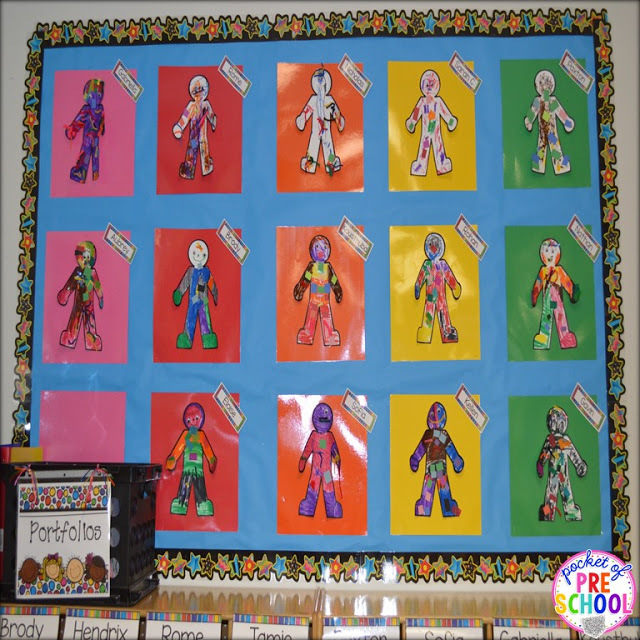 Little learners NEED visual schedules. Each piece is attached with Velcro. After each part of the day is finished, it is removed and placed in the basket. You can get my EDITABLE Visual Schedule in my store HERE. Look at my new (another summer project) job chart! It is bright and colorful just like my classroom. My old one was a little worn out. Just a note, if you make a clip chart put the students names on BOTH sides of the clothespins. I learned this the first time I changed the jobs. A few kids had their names upside down. You can get my Job Chart it my store HERE. We use clipboards a ton in my room. It is just something about giving a preschooler a clipboard that makes them powerful! 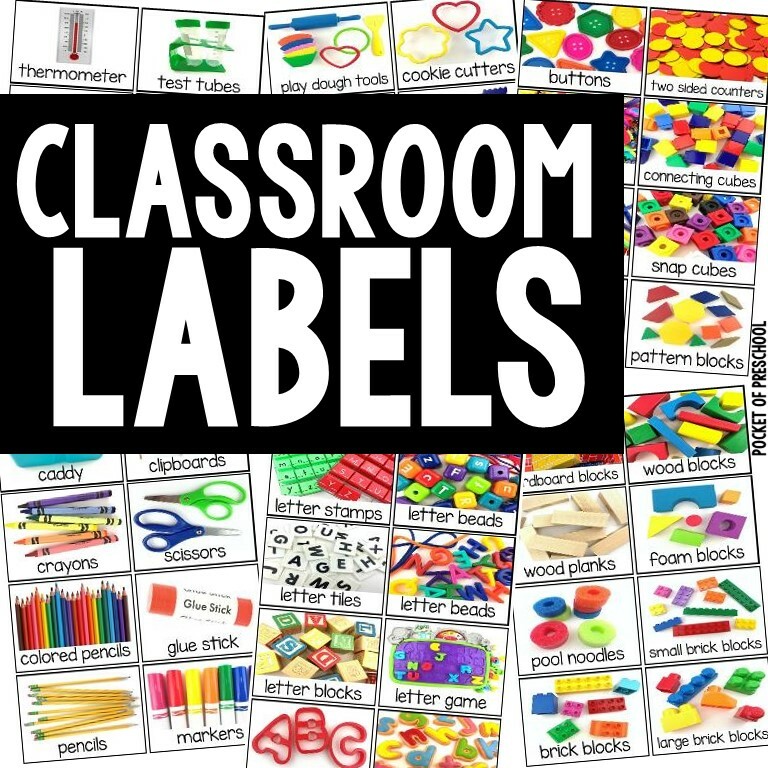 You can get my Full Page Classroom Labels HERE. This is the gross motor (and extra stuff) shelf I moved to the back of my circle (away from students) to reduce distractions. I have all my charts in a basket, magnet pizza pans (Dollar Tree), and dry erase boards are there too. This shelf makes everything easy to grab when I need it. CENTERS! I have 5 centers in my classroom: library, pretend, discovery, art, and blocks. 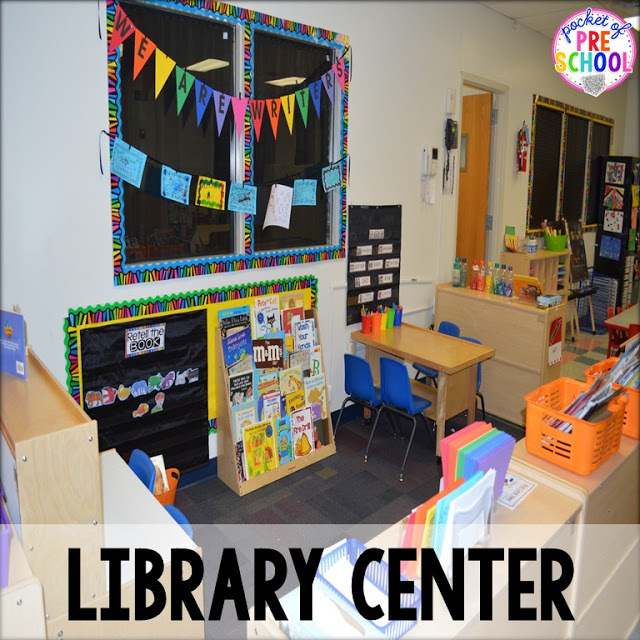 Check out my series about Learning Centers HERE with tons of fabulous freebies to help you set up your centers too! Read more about my block center HERE. I am very excited about my new I Can Build posters which you can get HERE (they now include real photographs too)! Books and supplies to be Construction workers! The empty paint cans and aprons are from Loews and Home Depot. My Library center which has reading, writing, and fine motor activities. This We Are Writers banner is a new addition to my Library center. I placed a black ribbon under it to clip students’ writing so it can be displayed in the classroom for all to see. My students LOVE retelling books using story sequence cards. I was so excited to find out that they make black pocket charts now! My students now will have a place to retell books all year long! We did Brown Bear Brown Bear this week during our All About Me unit. Go grab the FREE Family Word Cards HERE (with matching family writing paper and write the room pages)! My discovery center is all about math and science. I had to add a colorful Science banner to my Science table. It also points out to families where we are doing our science explorations! Read all about the Science center HERE and grab the Parts of a Scientist Chart and Discovery Pages! Read all about my Math Center HERE and grab the FREE path game you see on the shelf (in color and black and white). My Pretend center aka Dramatic play. I always start with home living and then pretend changes into something new with every theme. Read all about the Dramatic play center HERE. Some of my favorite things we have changed pretend into are a grocery store, vet, bakery, campsite, pumpkin patch, pizza restaurant, pet store, ice skating rink, farm, zoo, auto shop, and aquarium. Don’t you always want to know what’s inside the fridge? We have empty bottles (colored with paint to match what it is), plastic food, eggs and cupcakes made with model magic, and paper waffles and pancakes inside the box! Look at all the environmental print students are exposed to when you use real containers! My Art center. 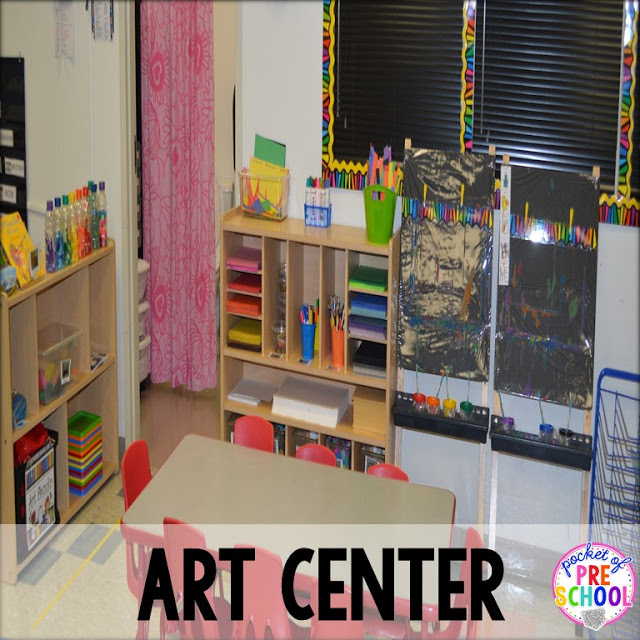 Read about my Art center HERE and grab the FREE art easel routine chart! My easel! It is covered in a black table cloth and is covered in plastic from the fabric store. The border is taped on to help my short students put on and take off their art work independently. Read about all my favorite Art Hacks HERE. This is my new bulletin board outside my classroom and I just had to make another banner for it too. I am going to put up picture of students “learning in action”. I want families to see that we are learning through play and play is POWERFUL! Back to school freebie? Yes please! Have a great back to school and if you are already back to school PIN IT to use next year! Click HERE to grab it now! So let’s talk about the printable decor! You can grab the Rainbow Decor pack if you are a rainbow girl like me or you can grab the Simple Design Decor pack if you prefer a simple design. And then there are the classroom labels with real photographs of toys and tools you can print, prep, and put on your shelf! These will be a giant time saver for you! Inspired? PIN THIS IMAGE FOR LATER!